The following will contain plot details from Starcraft 2: Wings of Liberty and Heart of the Swarm. Of course, Kerrigan tiptoes awfully closely to the latter. She certainly has the standard ‘tragic anti-heroine backstory’ box checked and double-checked. For those unfamiliar, Sarah Kerrigan was a soldier in Arcturus Mengsk’s rebel army until he left her to the Zerg after a failed mission. 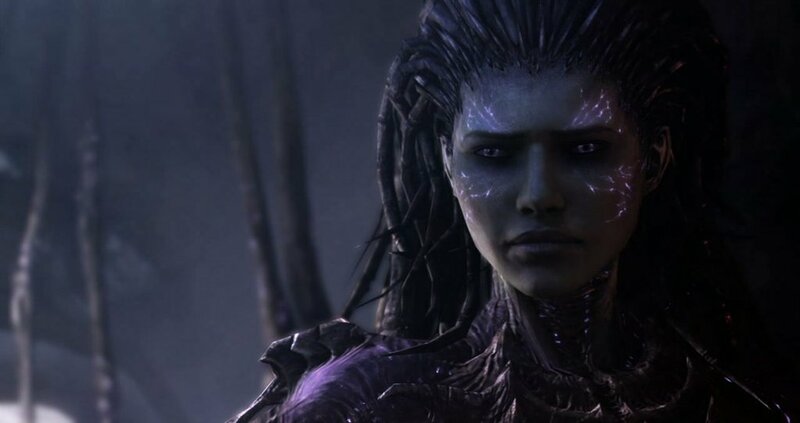 Infested, Kerrigan becomes the Queen of Blades and devotes herself to spreading the Zerg’s dominance across the galaxy, and getting her revenge on Mengsk in the process. Not the most innovative motivation, but it is refreshing to see a female character who isn’t afraid of her own strength. The anti-Elsa, so to speak. But even fierce, audacious Kerrigan has a major problem: consent. The issue of consent crops up in two places. The first is obvious; her entire character arc depends on it. Kerrigan does not choose to become infested, and even though she takes advantage of her abilities as a paragon of the Zerg, it’s never completely clear how much is Sarah, and how much is the result of the Zerg Overmind’s meddling in her psyche. But given a lack of evidence one way or the other in the narrative itself, it’s easy to give the writers the benefit of the doubt and assume that Kerrigan’s identity is perfectly consistent from her Terran self to her Zerg. While her transformation remains non-consensual, she owns her resulting identity. There’s a second issue of consent that pops up at the end of Wings of Liberty, however. Assuming that Kerrigan is fully aware and in-control of her Queen of Blades identity, it means that Jim Raynor completely subverts Kerrigan’s consent when he uses the Xel-Naga artifact to turn her, once again, into a human. Now, this course of action isn’t solely personal. The Queen of Blades is still responsible for millions of human deaths, and any way of neutralizing her is acceptable through that lens (after all, just outright killing her is also a betrayal of her consent). But there’s something deeply troubling about how the game frames this as a Big Damn Hero moment for Jim. At best, this is a sad but necessary action. Kerrigan was not a damsel-in-distress, and Raynor didn’t rescue her from a big nasty dragon. Suffice to say, I was worried about how Heart of the Swarm would portray Kerrigan. The first few missions did not make me any more optimistic. Kerrigan is lovesick for Mr. Raynor and mostly thankful (though a little conflicted) for his actions. But, a few missions in, Kerrigan inevitably becomes the Queen of Blades once again. Her motivation in this is pretty iffy — she thinks Raynor has been killed, and wants to use her Zerg powers for revenge. But even though the development is trope-heavy, there’s something important here. Kerrigan chooses to become Zerg once again. There are now no assumptions to be made about how accepting she is of her transformation; Sarah Kerrigan is fully, consensually, the Queen of Blades. This is not trivial. It’s arguably the most important concept to Kerrigan’s arc, and the one thing that Heart of the Swarm needed to do to successfully advance her story. Starcraft 2 certainly had storytelling missteps. But affirming Kerrigan’s consent makes up for the hiccups. I’m assuming that her character growth is finished, for now. The game’s finale, Legacy of the Void, focuses more on the Protoss, and Kerrigan’s desire to exterminate the big baddy in the sky is a lot less interesting to me than what she’s done before. Still, if this is the last we see of her, I’ll be happy enough.